Aam Aadmi Party has alleged that defence minister Manohar Parrikar is holding parallel cabinet meetings in Goa, in total violation of constitutional provisions. AAP national spokesperson Ashutosh today told media that the party delegation would shortly meet Governor Mridula Sinha, pointing out the ‘illegality’ to her. “Who is the chief minister of Goa? Laxmikant Parsekar or Manohar Parrikar?”, he asked, stating that Parrikar’s office at Paryatan Bhavan at Patto Plaza has literally been converted into de-facto CM’s office. According to Ashutosh, Parrikar is holding cabinet meetings at his office at Paryatan Bhavan by summoning ministers, secretaries and even directors of various departments. “Parrikar should explain why secretaries of different departments and other senior officials visit him with confidential files while he gives oral instructions bypassing Parsekar”, he alleged. According to journalist-turned-politician, the recent statement of deputy chief minister Francis D’Souza was enough proof of the fact that Parrikar keeps even the ministers in dark about certain important policy decisions. Ashutosh pointed out at health minister D’Souza’s statement that he was not aware of the details of the Deen Dayal Swasthya Seva Yojana. He also recalled how BJP had created hangama during UPA regime that ministers of the Manmohan Singh government were directly reporting to Sonia Gandhi to get the files cleared. 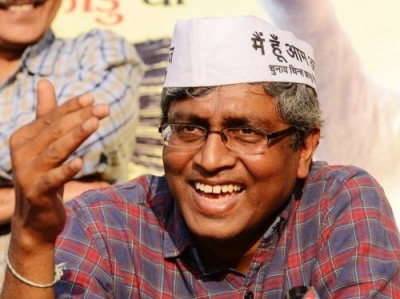 “Is Prime Minister Narendra Modi aware that his own defence minister is trampling the Constitution of India in a similar manner?”, asked Ashutosh.